Edwin Parker "Cy" Twombly, (April 25, 1928 – July 5, 2011) is an American painter, draughtsman, printmaker and sculptor from Lexington, Kentucky. He served in the U.S. army as a cryptologist and we can see this work experience as having an influence on his painting style. Many refer to his paintings as looking like scribbles or calligraphy on a blackboard. He steered clear of color using gray, tan, or off-white in his works. From 1955-1959 he lived and worked in New York, where he became friends with Robert Rauschenberg and Jasper Johns. As he became familiar with the New York School or abstract expressionism he began simplifying his work even more and his work began to take on a very simple form of abstraction. It was here that he became interested in tribal at and primitivism. During this period he traveled North Africa with Rauschenberg, this trip certainly influenced his work. Twombly soon developed a technique of gestural drawing that was characterized by thin white lines on a dark canvas that appear to be scratched onto the surface. His early sculptures, assembled from discarded objects, similarly cast their gaze back to Europe and North Africa. He stopped making sculptures in 1959 and did not take up sculpture again until 1976. He later moved into romantic symbolism and he often quoted poet Stephane Mallarme. During this romantic period his work made references to classical myths and stories. He also looked to classical themes in his sculpture. From 1976 he began creating sculptures from found materials or cast in bronze and covered in white paint and plaster. These sculptures took on classical forms as they were lightly painted in white. Twombly began taking photographs during his student days. It was in the later stages of his career that he began publishing them. 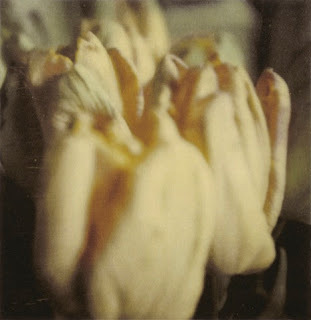 Many of his photographs included large blurry color images of tulips, trees and ancient busts, all from his Polaroids. He published them in Cy Twombly Photographs III . Today Twombly is represented in many museum collections. He is said to have influenced younger artists such as Anselm Kiefer, Francesco Clemente, and Julian Schnabel. Read more about this exhibit at: Cy Twombly: Photographs 1951-2010.